If you are looking for low cost new Suzuki parts in Essex, you might think that you have to go to a main dealers. Well you have found an alternative to them, which we hope you will consider to be the only place to go for your new Suzuki spares from now on. 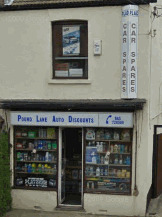 Welcome to Car Spares Essex, the online route to Pound Lane Auto Discounts, the number one car spares shop in the whole of Essex. The following list shows all the Suzuki models that we have stock waiting and ready on both our shelves, and online store. Although of course there are sometimes that stock flies out the door quicker than we can replace it. But don't worry as our stockists are brilliant and can generally get the part to us within a few hours if that is the case. "Goodbye Suzuki Main Dealer Prices!" What Do You Do If You Don’t Have The Suzuki Parts I Want? Well this is a very good question, and unlike many car shops in Essex and the South East, we are a family owned business, so rely on our happy customers. So if we don't have the Suzuki spares you want, exactly the same as all other models of vehicles that we can cater for, if we haven’t got the part at the time of your visit which is unlikely, we will do everything we can to get it for you. And this might mean the next day, or more often than not within a few hours. So we will bend over backwards as much as possible to help you. We will just need a bit of help straitening back up though….not as young as we used to be after all. With a history in the industry stretching back over 25 years, we are in contact with all the Suzuki breakers, or manufactures that can supply us as a priority. However I guess it is fair to say that sometimes we just won’t be able to help provide your Suzuki parts such as a brake cable for your Suzuki Mighty Boy pickup (I think we have one of those actually….but we are making a point here), and it’s not something we have or can get. But that shouldn’t be a problem either as we have been around the Suzuki parts and spares world for over 30 years, and so we can tell you where to go and get it. You may not be our customer the first time you contact us, or the second, but we will do our best to make sure when you need some Suzuki parts you at least think of Car Spares Essex aka Pound Lane Auto Discount first. You know the best thing to do though, is simply use our online Order form as we stated, and we can buy it in ready for you to come and collect. How easy is it that! Do You Deliver Your Parts Around Essex? We try our best to provide the best service around, but unfortunately this is one of the things that we just don't have the capability for. Being a family owned business, we would be severely stretched if we offered this. Instead we prefer to focus all our energies on our face to face customers, dealing with the busy phones, and of course keeping our online store stacked to the limit. Ok You Sound Great Where Can I Find You Exactly? As you can see from the map below we are in a great location for all motorists in Essex. The A127, A13 and A130 all literally pass by our door, which makes a journey to us only about 20 minutes at most from anywhere in Essex. Many of our customers come to us for their Suzuki bits from miles away, which we are of course glad off. If you want more detailed directions you can check out our page here. Or if you want to use Google Maps and simply enter your postcode for door to door driving instructions then use the link below the image.